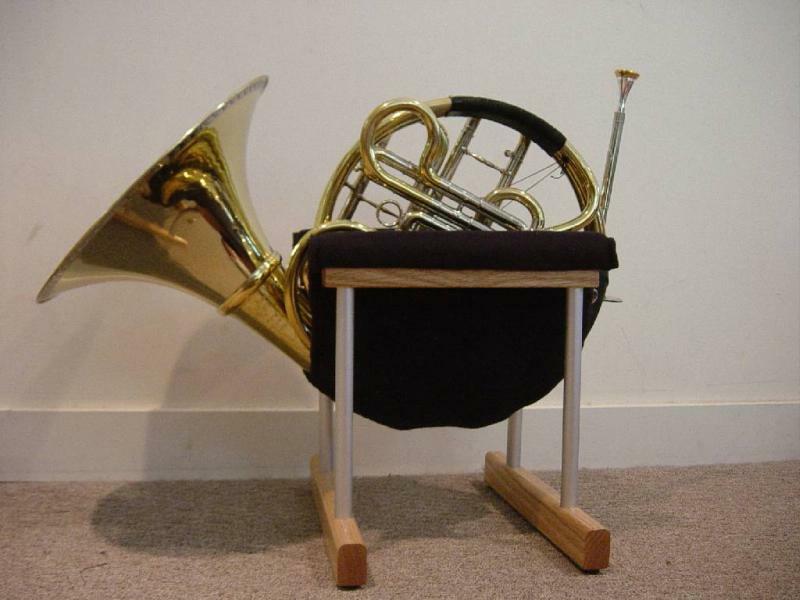 Our stand is designed to fit all standard single, double, and triple horns. If you own an unusual or rare horn and are concerned about whether it will fit in a Soft Stand, follow the measuring procedure outlined here. 1. Place the horn on a bed or similar soft surface. Either remove the bell or hang the bell over the edge. 2. Find the thickest part of the horn. Consider water keys as well as the tubing. In the case of this one, the thickest part is at a water key. 3. Measure the thickness at that point. For this horn, the maximum corpus thickness is 3.75 inches, so it will fit properly in the holder. If your horn measures above 4.0 inches (10 cm) contact us before placing an order. We try to keep some blank leg stock around for custom setups, but it is best to check with us before ordering. There is no additional charge for setting up a wider rail spacing. All single horns will fit in a Soft Stand. This picture shows how the horn is held. Note that none of the bell and only the lower half of the instrument goes into the pouch. Be sure to measure only the areas that actually go into the Soft Stand.